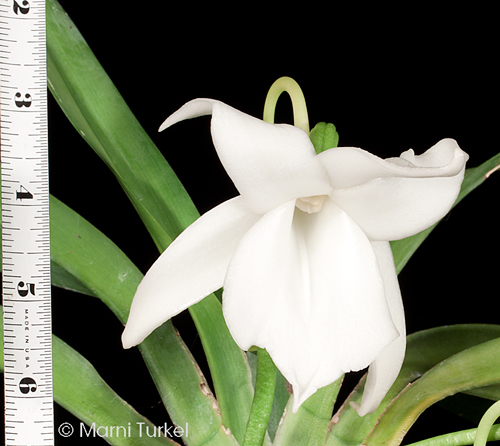 Angraecum magdalenae outcross #857 ('2897' x 'DN') (approximately 25 seedlings per flask). The Species: This occurs in Madagascar at elevations from 2600 to 6600 ft. 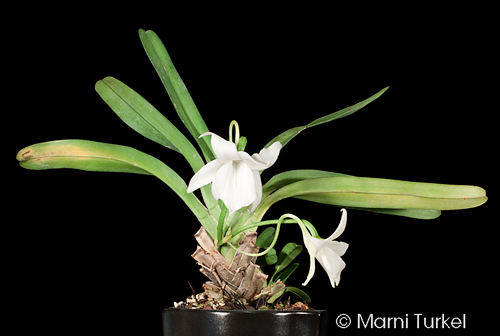 The flowers can be up to 4", are long-lasting and have a wonderful fragrance. Culture: I have been growing this species with cool to cold nights and warm days. The winter minimum is 45F in bright light. I have it potted in a fine bark mix that is approaching dryness before the plant is watered again. Literature suggests a dry winter, but I haven't tried that yet. The plant came to me in pretty rough shape a couple of years ago but is doing well and has bloomed several times.